ADD UPDATE, 9 January 2018: In response to Isabelle Fraser’s article in the Daily Telegraph on 3 January, entitled “Meet the ‘Yimbys’ arguing for more homes to be built in their area”, the letter below was published in the paper this morning. Thanks to everyone’s support over the weekend, it was co-signed by Mark Lloyd, CEO of The Angling Trust; Stephen Joseph, Chief Executive of Campaign for Better Transport; and Dees Haas, Chairman of Campaign to Protect Rural England Hampshire, plus 252 others. To view an image of the letter, see above, click here or view the Daily Telegraph’s letters page. We continue to work hard to defeat Eastleigh’s proposed Local Plan. If we stick together, we remain confident that we can do so. Eastleigh deserves better. 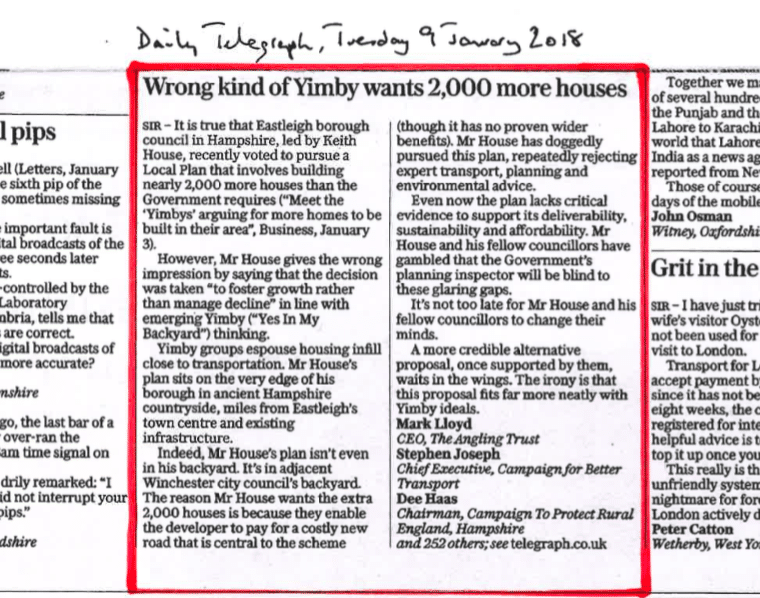 Sir – It is true that Eastleigh borough council in Hampshire, led by Keith House, recently voted to pursue a Local Plan that involves building nearly 2,000 more houses than the Government requires (“Meet the ‘Yimbys’ arguing for more homes to be built in their area”, Business, January 3). However, Mr House gives the wrong impression by saying that the decision was taken “to foster growth rather than manage decline” in line with emerging Yimby (‘Yes In My Backyard’) thinking. Yimby groups espouse housing infill close to transportation. Mr House’s plan sits on the very edge of his borough in ancient Hampshire countryside, miles from Eastleigh’s town centre and existing infrastructure. Indeed, Mr House’s plan isn’t even in his backyard. It’s in adjacent Winchester city council’s backyard. The reason Mr House wants the extra 2,000 houses is because they enable the developer to pay for a costly new road that is central to the scheme (though it has no proven wider benefits). House has doggedly pursued this plan, repeatedly rejecting expert transport, planning and environmental advice. Even now the plan lacks critical evidence to support its deliverability, sustainability and affordability. Mr House and his fellow councillors have gambled that the Government’s planning inspector will be blind to these glaring gaps. It’s not too late for Mr House and his fellow councillors to change their minds. A more credible alternative proposal, once supported by them, waits in the wings. The irony is that this proposal fits far more neatly with Yimby ideals.